This entry was posted on Saturday, June 20th, 2009 at 12:55 am	and is filed under C++, STL. You can follow any responses to this entry through the RSS 2.0 feed. Both comments and pings are currently closed. Gnulib’s array_list more closely resembles std::vector or std::dequeue. Much like Gnulib, STL gives you a wide selection of data structures and algorithms. It isn’t very useful to compare just one of them against a variety of Gnulib’s containers. I’m sure Gnulib will still look pretty good if you give it a full and fair comparison. As you hint in your conclusions, your methodology is deeply flawed – you’re comparing apples to oranges in several places. 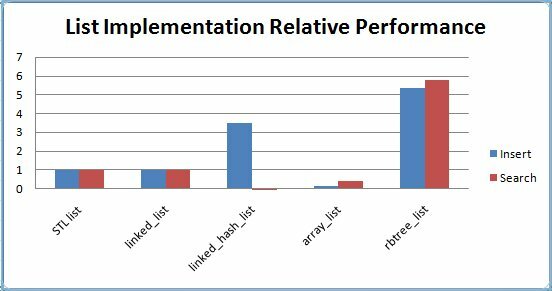 It only makes sense to compare different implementations of the same algorithm; for example std::list vs. linked_list, std::vector vs. array_list, etc (I don’t know enough about gnulib to give anything but guesses as to what the equivalent data structures are for the others). Thanks for pointing this out. Of course you are right and this was my mistake. I’ve updated the post to point out the error and to clarify and I will add the other STL containers to the comparison and publish the results shortly in a follow-up post. Thanks again for the feedback.